Try this homemade beading project to make your own crystal night light shades. Quantity of beads and placement is listed below, for each shade style. Divide beads for pins by 9 and feed each pin with the divided number of beads. Close pin clasp and be sure the clasp is secure. Feed onto a piece of wire, one top bead, then 1 pin (shown on pin diagram as “top”) and continue until you have 9 pins and 9 beads (one between each pin) in total. Twist wire securely and hide wire between bead and pin (this is where you will need the pliers). Feed bottom beads onto another piece of wire (divide total bottom beads require by 9) and then feed 1 pin, then bead or beads, through the centre of clasp area (shown on pin diagram as “bottom”), continue until you have 9 pins in total, with equal number of beads between each pin. Twist the wire securely and hide wire between bead and pin. When feeding pins through the wire, be sure to keep the beaded side of the pin on the outside of the shade. The shade will rest directly on top of the light bulb and it is important that the beads do not come into direct contact with bulb itself. 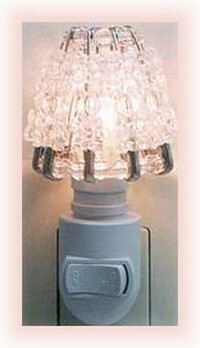 The unbeaded section of the pin will rest on the bulb. my mother made one years ago . 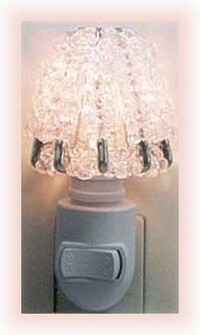 I want to create one for her grandchildren as a gift from her where can i get the light fixture in bulk?